This is one of my favorite scenes from a trip to Utah. Monument Valley is a place probably everyone has seen whether you've been there or not, as many westerns and commercials have been filmed there. Great sandstone formations abound, the last remnants of what were once sandstone layers, eroded away over time. The red mesas and buttes are a deep rich color every bit as beautiful as the pictures you see on a postcard. If you visit, take the drive in the early morning or evening when the light is best. 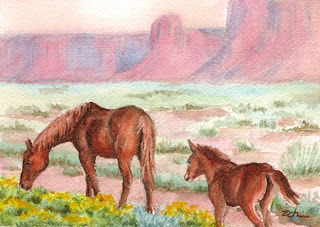 In the rosy light of this hazy morning scene, some horses graze on the sandy desert plain.